The Christmas decorations are slowly being returned to their dusty homes; the fridge is no longer the keeper of an army’s supply of festive foods and the radios have ceased playing the iconic Christmas classics because as much as we would love for it to be Christmas every day, sadly that is not the case. Christmas Day and New Year’s Day have come and gone with their abundance of good food, good company and good times and this of course means it is that sorrowful point of the year where all the goodwill and celebrations have ceased and we have to return desolately to our desks. However, while January can be a tough slog, what with the cold weather and the Christmas bills still cowering in our wallets, nevertheless it is still a brand new start meaning all kinds of potential lie ahead. Whatever adversity or struggles you faced in 2016, now you have a blank page upon which to write a whole new chapter and to start all over again. Therefore, this is where New Year’s resolutions come into play because a new page means a new opportunity to change our ways. We have all heard of them and we will have all probably devised a few over the years with the best of intentions. However, it is irrefutable that while resolutions are fairly easy to come up with, they are a lot more difficult in practise. The reasoning is because normally resolutions are often related to cutting something out of lives, and that ‘something’ is normally a vice or indulgence – the things that bring us a lot of joy and pleasure, even though we know they are bad for us. Therefore, resolutions tend to pertain to goals like losing weight by cutting out bad food or to stop smoking. However, while the results of such resolutions are undoubtedly rewarding, it can be hard to get excited for the process as they require a lot of discipline. Therefore, how about balancing out your tougher resolutions with a goal that is fully rooted in fun, fulfilment and adventure with no discernible negatives? This goal will allow you to see things you may have never seen; to meet people you may have not otherwise met and to create memories that will last a lifetime. Guessed what it is yet? If not, we can only be talking about the New Year’s resolution of travelling of course! Ok, so we know what you are thinking, travelling is expensive and normally resolutions can be associated with cutting costs. However, travelling really does not have to be all that costly when you consider staying a little closer to home and engaging in a staycation. So often people talk of wishing to travel more but this does not mean that you have to dig out your passport and fly somewhere exotic. Travelling can simply be visiting the hidden gems that are only a few hours away as even in our own hometowns, there are wonders that we will have not experienced. Sometimes the most enlightening thing we can do is experience our home town and home country through the eyes of a visitor because then we realise all the potential fun, history, beauty and culture there is to soak in which we often can otherwise ignore. Have we managed to sell you on the resolution of travelling more in 2017? If so, we can further help cut the costs associated with travelling because with apartments that are capable of holding up to six persons but that are not charged per person; our serviced apartments are the perfect cost-effective alternative to hotels. This is particularly true when you consider how that as our apartments come complete with a fully-equipped kitchen and lounge, you can further cut down on the costs associated with dining out. Never tried a serviced apartment before? Well, it looks like you just found another new resolution! Book today at www.thespires.co.uk, email info@thespires.co.uk or phone 0345 270 0090. If there is anything that we pride ourselves on about our apartments it is their ultra-convenient and central locations. However, if you believe bias to be clouding our judgement, check out these vibrant and quirky word clouds we compiled from Trip Advisor reviews which only attested to how all our guests also agree that we come top when it comes to location. Our post codes only speak to this as with highly sought after locations on renowned UK streets including Edinburgh’s Hanover Street and on the doorstep of Birmingham’s ultra-exclusive retail paradise known as the Mailbox, we are clearly right in the hub of all the excitement and adventure that cosmopolitan Britain has to offer. However, while we do reside in some of the UK’s biggest and best cities including the glittering granite exterior of Aberdeen and the world renowned hospitality and friendly banter of Glasgow, we appreciate that maybe you want to explore horizons further afield. For instance, maybe you are feeling courageous and want to pay the infamous Loch Ness Monster a visit or perhaps the bright lights of the UK’s greatest metropolis and dear capital London is calling you. Wherever you like, whatever destination your heart desires, from Dundee to Manchester to Liverpool to Newcastle to Belfast, with ‘The Apartment Collection – By The Spires’ we can find the perfect serviced apartment accommodation for you. Wondering how? Let us explain. While we would love to say that we have managed to grow overnight and launch brand new apartments in cities from the top to the bottom of the country, unfortunately that is a dream for another day. However, that has not stopped us from developing connections with serviced apartment providers all across the country and subsequently alongside the title of ‘serviced apartment operator’, we also would like to add ‘serviced apartment agent’ embossed on a gold name plaque. Consequently, no longer can we just provide you with the ultimate experience in serviced apartment accommodation when you stay directly with us, but we can also source you the best possible stay even when you are not staying with us. At The Spires we are all about delivering our guests with the best experience possible and this is something that we want to continue whether you are staying with us or not. Therefore, we will only source you accommodation with serviced apartment providers who we believe share the same values and ethos as us in relation to customer service. Consequently, we are taking the stress out of your hands in relation to scouring the internet to see if providers are really living up to their proclaimed reputation through those rigorous Trip Advisor checks. All you have to do is dial the magic telephone number to The Spires and you can put your feet up as we do all the sourcing work for you through our network which we have accumulated afters years in business. Therefore, we really are a one-stop-shop when it comes to serviced apartment living. From offering up our own apartments to helping you find accommodation when we do not have apartments in the city locations you want to stay in, one call to The Spires will sort out all your accommodation enquiries. Whatever the destination, serviced apartments really are the perfect cost-effective alternative to traditional hotels as the flexibility, freedom, space and convenience they offer just cannot be rivalled – wherever you venture in the world! Therefore, whatever your travel circumstances, whether you are travelling for 1 night or 1 year, whether you are travelling nationally or internationally or whether you are flying solo or as part of a family trip, we will be able to source you the best stay so you do not have to. With the October holidays on the horizon (an ample opportunity to explore all the treasures that the world has to offer) it is the perfect time to consider visiting somewhere new. Therefore, make sure to visit our dedicated ‘The Apartment Collection – By The Spires’ website to get the inspiration rolling or if you already have a location in mind, phone us at 0345 270 0090 to get your holiday booked. Wherever and whenever, The Spires have your every travel need sorted. Every day is a beautiful one, but even more so when it is a well deserved day off. Yes, there is nothing quite like waking up despondently all warm in your bed with your mind consumed by the dreary thoughts of work and stress, only to remember that you can throw that infuriatingly cheerful ringing alarm clock against the wall in victory because you are free of your workplace shackles. It has to be said that nothing brings the nation’s mood and spirit up quite like a few days away from the workplace (for example, the best invention ever: Bank Holidays). Some of us like to laze about on our sofa in our pyjamas, zombified by the almighty power of Netflix whereas others prefer to engage in some rather enticing retail therapy. Do not get me wrong, both of these options are perfection; however in those free glorious days, I like nothing better than to put on my explorer’s hat and travel because I tend to suffer from a case of insatiable wanderlust. Unfamiliar with this intriguing new word? Until this year, I too was not familiar with it but being a key travel bean, it was a term that my vocabulary welcomed with open arms. If we are to go by the ever reliable Wikipedia, Wanderlust translates as a “strong desire for or impulse to wander or travel and explore the world” (Oxford Dictionary will attest to this) and it stems from the German words of wandern (to hike) and lust (desire). I have also just discovered that the modern German phrase that has been coined to reflect the itching of the feet and mind to venture to far off places is “Fernweh” which translates as an “an ache for distant places; the craving for travel”. Even with its German origins, it is clear that this is a universal word we all understand because it is more than just a word; it is also a feeling, an emotional reaction and a compulsion. In my mind, there is no better past-time or gift than to explore. There is so much to be seen; to be eaten and to experience, why would you not want to go out and bask in it? Obviously, there are the slight restrictions of time and money as well as work and family obligations. I am particularly guilty of neglecting these slight obstacles when I go into one of my impassioned speeches about how I aspire to go to Singapore, Malaysia, Beijing, New Zealand, Alaska, Hawaii, Dubai,x,y,z…. The thing is sometimes I think I can be a bit close-minded. Whenever I think of holidays and vacations, I always visualize tranquil untouched beaches; exuberant and vivid market stalls selling all kinds of authentic goods and trendy, hipster hidden cafes offering salivating local delicacies. Essentially, wherever I think of has to be out with the familiar borders of the UK and involve some extensive form of transport. However, as part of the launch of the “Apartment Collection-By The Spires” and its associated website, I have been researching all the serviced apartment locations across the UK and this has sparked within me a desire to see more of the UK. From Harrogate to Newbury, these are all locations I had never thought of before and which now have a solid position on my travel bucket list. I never knew about the true picturesque nature of Cambridge; St Alban’s Viking heritage or York being home to one of the best preserved streets in the UK, and between all these fascinating facts I uncovered, as well as stunning photos of the exquisite architecture, I definitely have a strong case of UK wanderlust. Therefore, even if you are constricted by time and finance like so many of us are, I am sure there is an exciting place offering its own adventures and beauties potentially only a bus or car ride away from where you are. The definitions of words like “travel” and “wanderlust” have nothing to do with venturing to somewhere a set distance away, there is always something new to discover and there may be something just down the road to satisfy your thirst to explore and travel. We are all guilty of ignoring our own country as a potential travel spot but every location, no matter how near or far from your home, has its own story to tell and its own sights to be seen. For instance, whenever I hear people say they want to come to Scotland, I am always bemused by what they find so enticing about it. However, then I find articles and photos like this, http://www.buzzfeed.com/hilarywardle/scotland-is-the-worst-aplm#.ka5DWRMRD and I too have to bow down to the greatness of Scotland. Perhaps looking at our home towns and countries through the eyes of a tourist could be the greatest thing we could do. Ultimately, one of the greatest trends in the tourism industry is that nowadays we all have a desire for authentic experiences. Yes, a lot of us do still enjoy a nice, relaxing all-inclusive beach getaway, but equally so much of us want to venture out to all the hidden gems of the world and have a trip that encapsulates the local community and their local attractions. This is why I firmly believe that travel is one of the greatest gifts we have been bestowed with because it is infinite in its possibilities-there is always somewhere new to explore and something new to learn. Life is all about new experiences and challenging ourselves and what better facilitates that then travel? Travelling takes you to new destinations where undoubtedly you will learn something new about yourself, be it a new skill or an undiscovered inherent characteristic. We can travel to challenge ourselves, or simply to relax and escape the stressful monotony of day-to-day life. Whatever it is, this mammoth world exists to be explored and this is why I am confident that my serious case of wanderlust will never be cured and why I am happy it never will. 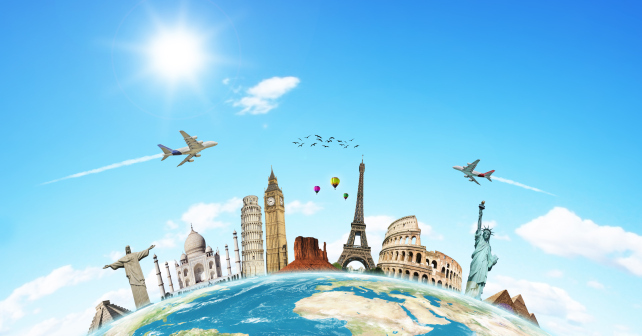 Do you suffer from wanderlust too or have any places that you are itching to go to? Let us know which locations have made it on your bucket list!